DNS Roller is made specifically for home use. All aspects of the manufacturing process have been thought through with the home user in mind. Unlike other brands which usually cater mainly for the clinical treatment market, the DNS roller represent a forward step in home dermaroller use. Conventional methods of skin nourishment feeds only the upper layer of our epidermal. The effects are often slow working and insignificant as the average absorption level of our skin only reaches a mere 0.3%. As a result, the expensive lotion or serum that are mostly wasted. 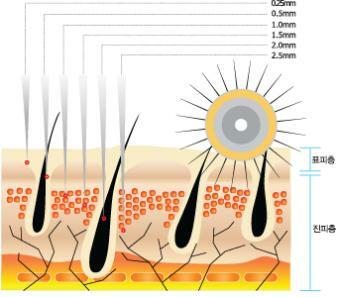 To maximize the absorption process, skin scientists developed the technique of Derma Needling Therapy to effectively increase the penetration of nutrients by producing microscopic punctures to our derma. The minute opening will facilitate the inflow of the applied lotion, thus allowing our lower derma to directly soak up the precious nutrients. In addition to the enhanced nourishment, the treatment also stimulates a self healing process which triggers our skin cells to produce high doses of collagen to construct firmer and younger looking skin. The simple and elegantly designed DNS Classic 8-Line Roller is the original Derma Needling System introduced by bioGenesis London. This simple roller is one of most commonly used tool for performing the micro needling therapy. Its refined titanium alloy needles are smaller in radius and shaper at the tip, allowing more accurate and refined punctures that enhances the result of the treatment. As an 8-Line roller, the DNS Classic 8-Line is embedded with 192 individual needles, offering the basic necessity for performing the micro needling treatment. Its ergonomic handle design also optimizes the pressure applied, improving the overall achievable result. DNS roller is a premium quality derma roller which has gained a reputation for being one of the best on the market. If you are looking for high quality and long-lasting roller, then DNS roller is your best choice! All DNS rollers are sterilized and assembled with extreme care, with titanium needles. 1.5mm is most often used on the body to treat stubborn deep stretch marks and cellulite (usually on the buttocks, hips, etc. ), and deep scars and wrinkles. The 3-line model (with 72 needles) is suitable for hard to reach areas (such as the nose or under the eye), small scars, etc. The 8-line model for treating larger areas of the body. Most people will prefer to numb their skin with a topical anesthetic such as our Numbing Cream. The DNS Roller, as a skincare device, is designed to use on Derma Rolling System which is called a 4-generation skincare program and consisted of various kinds of needles, such as 0.5mm∼1.5mm, for optimal treatment on the skin.